I hope one day Christians will open their eyes and realize that Christ is NOT the Jewish messiah; he never was, he never will be. Everything about Christ was anathema to Jewish belief and practice. The Christian God is a universal God of compassion, love and forgiveness. The Hebrew deity is a tribal god of war, genocide and vengeance. The Triune God of Christianity (Father, Son, Holy Spirit) has no similarities to the tribal deity Jews worship. Moreover, it should be added that the first portion of Jewish sacred literature (e.g. earth's creation, garden of Eden, great flood) were adopted by Jews from proto-Armenian peoples of Asia Minor. In fact, Abraham, said to be the "father of Jews and Muslims", was a proto-Armenian who lived in the Armenian city of Urfa (Edessa). The rest of Jewish sacred literature is basically their national history as seen thorough the eyes of their prolific prophets, some of whom were truly righteous men. Moreover, it should be noted that a virgin giving birth to a godman is purely a pagan concept and scriptures associated with Christ are peppered with solar symbolism. Similarly, triune gods were well known throughout the pagan world but were seen as blasphemous in Jewish tradition. Zoroastrianism, the oldest monotheistic religion in the world and a faith founded by Aryan peoples in the vicinity of the Armenian Highlands, is the closest any religion can get to Christianity. In fact, upon closer examination, one can see that Zoroastrianism is intimately tied to Christianity. Hidden in plain sight is the astounding realization that Christ's earthly life began with Zoroastrians and ended with Zoroastrianism. As the Jewish king Herod sought the newly born infant Christ to KILL him, three Zoroastrian Priests (known as Moger in Armenian and Magi in English) from the east (either from Persia or Armenia) were seeking Christ to instead WORSHIP him! While Christ was nailed to the cross, he looked that the crucified thief next to him and said, "today you will be with me in PARADISE"! Paradise, meaning garden, is a Persian word; not a Hebrew word, not an Aramaic word. Paradise's association with heaven and the afterlife is exclusively a Zoroastrian and now a Christian concept. Jews have never believed in an afterlife in the way Christians do. What's more, the only other sacred book on earth that the divine being known as "Holy Spirit" appears in is the Zoroastrian Avesta, where it appears by the Persian name of "Spenta Mainyu" (also meaning holy spirit) and also functions as the messenger of the supreme deity, Ahuramazda. Christ in fact lived a strict Zoroastrian lifestyle; he refused material possessions, resisted physical urges, spoke about the importance of good deeds and emphasized the existence of an afterlife. Moreover, all of Christ's students were Hellenized Jews. In his teachings to the Jews, Christ is said to have only quoted from the Septuagint, the Greek translation of Hebrew sacred text. The Septuagint was outright rejected by conservative/traditionalist Jews because the translation contained pagan influences. The Septuagint is clearly a by-product Hellenized Jews. When you translate a large volume of work into another language, it is inevitable that a lot of things will get lost and/or altered in translation. It is also inevitable that the culture of the language it is being translated into (in this case pagan) will also eventually seep into the work. This is essentially why Jews reject the Septuagint. The fact that Christ only spoke Aramaic (lingua franca of the time) and only quoted from the Septuagint was enough reason for Jews who were trying to resist the Hellenization of Jewish society to conspire against him. The Septuagint cannot be considered Jewish because Jews themselves rejected it thousands of years ago. Christians need to be fair and admit that Jews should know their religion better than us goyim. Christ was not of the Jews. Christ was not the Jewish messiah. Everything about Christ, from his lifestyle to his mysteries, were replete with Zoroastrianism. There is nothing in the Jewish Torah and Tanakh that foretells Christ. Everything christian clergy point to in this regard are either wishful thinking, selective reasoning, a result of mistranslated Hebrew texts or contrived attempts by the early church fathers to fuse the two main religious traditions of the Eastern Roman Empire. We have thus been trying to hammer a square peg into a round hole for two thousand years - essentially because Hellenized Jews and later, Emperor Constantine wanted to unite the Roman Empire's Pagan and Jewish traditions. To reiterate: When Christ was born, the Magi ( Zoroastrian priests) from the east (Persia or Armenia) came to WORSHIP him, while the Jewish king was seeking Christ to KILL him. This happened right in the beginning of the Gospels. And at the end of the Gospel, we read about a crucified Christ telling the righteous thief crucified beside him, "today you will be with me in PARADISE. Christ began his earthly life with Zoroastrians and ended it with Zoroastrianism. In my opinion, and may God forgive me if I am mistaken, Christianity was the manifestation of Zoroastrian mysteries in Palestine. Christ was "judeofied" through the efforts of Emperor Constantine the Great, who's intent was political - to unite the empire's large Pagan and Jewish communities under one spiritual/ideological belief system. The early church fathers were therefore given the task to fuse the Jewish tradition with Christ's Gospels (a process that had already been started by Christ's Hellenized disciples). This newly formulated religion, tenets of which ran counter to many Christians communities at the time, was then spread throughout the world through the use of force. Many Jews at the time (probably most) melted into this newly formed Christian world. Modern Jews are essentially the decedents of those who successfully resisted the Roman Empire's "social engineering". These are my personal beliefs. It took me a lifetime and a lot of research - and psychological effort - to come to these realizations. It was a troubling journey, but in time, the realization that Christ could not have been the so-called Jewish messiah and that Christianity is the continuation of Zoroastrian mysteries only deepened my faith in a universal God. With a proper mindset, some objective research and a lot of meditation, you may also begin to see Christianity in a whole new light. If you have a thirst for knowledge, I encourage you to seek. My intent here therefore is not to disprove Christ's existence or to negate his divine essence. My intent here is to rather reveal Christ in a different, more applicable light than which has been provided to us by the early founders of the Christian church. Unfortunately, many Western (i.e. Anglo-American-Jewish) biblical scholars today address Christ's non-Judaic attributes primarily to attack and discredit Christianity. I believe that the realization and acceptance that Christ was not the Jewish Messiah does not undermine his historic reality nor does it undermine his divine message. In fact, looking at Christ from a non-Judaic perspective magnifies his universal message as well as his divinity. I simply ask the reader to exercise sound judgment and due diligence when researching this topic. When reading relevant materials on this very sensitive subject, I ask the reader to take the research about Christ into consideration without the anti-Christ bias with which it is often presented. In other words, I am asking you to read between the lines of what they write to rediscover Christianity. The true essence of Christ and Christianity can only be fully appreciated when they are looked at from an eastern perspective and more specifically, from within a pagan and Zoroastrian context. Zoroastrianism is one of the most ancient religions of the world. At one time it was the dominant religion of Iran and adjoining regions. Its popularity declined when the Islamic invaders occupied Iran and introduced Islam. A handful few who fled from Iran,after the fall of the Sassanid Empire, to escape persecution in the hands of the new rules took shelter in India. They are known today in India as Parsis, a small community that has been persistently striving ever since to keep the tenets of the religion alive, despite hardship and lack of following. Apart from them a few people in Iran continue to practice Zoroastrianism. They enjoy a minority status in Iran, an Islamic nation, with a limited degree of freedom to practice their religion. The total number of people practicing Zoroastrianism in the world today would be around 250000 of whom 80% live in India and the rest in various parts of the world including the USA. Although Zoroastrianism lost its status as a popular world religion, its study and knowledge are very useful in our understanding of the development of religious thought in the ancient world and how some of its important beliefs and practices have parallels in other religions such as Judaism, Christianity, Islam and Hinduism. The following are some of the important beliefs of Zoroastrianism. Zoroastrianism, Judaism, and Christianity share so many features that it seems that there must be a connection between them. Does this connection really exist? If so, how did it happen? And how much of the similarity between these faiths is due simply to parallel evolution, rather than direct contact and influence? The simplest answer to the first question is, yes, there is a great deal of Zoroastrian influence on Judaism and Christianity, but the problem is that it is hard to document this exactly, at least in the early stages of Judaism. The evidence is there, but it is all "circumstantial" evidence and often does not stand up to the rigorous judgment of scholarship. Nevertheless, I will dare to present these ideas assertively, with the qualification that there will likely be no definite way to prove them either true or untrue. In 586 BCE, the forces of the Babylonian Empire conquered the Jews, destroying their Temple and carrying off a proportion of the Jewish population into exile. The captives consisted especially of educated and upper-class people as well as the royal family. This "Babylonian captivity" lasted almost fifty years. In 539 BCE the Persians, under the leadership of the Achaemenid King Cyrus, conquered Babylon, and in 538 Cyrus issued a decree stating that the Jews would be allowed to return to their homeland. Not only were the Exiles released, but Cyrus, and to some extent his Achaemenid successors, also supported the rebuilding of the Jewish Temple in Jerusalem. Cyrus' policy was motivated not only by his religious tolerance (he also encouraged other, pagan peoples to maintain their own religions) but by statesmanlike wisdom; people treated generously are less likely to rebel. But not all the Jews wanted to go home. In the years of Exile, the adaptable Jewish people had established themselves in Mesopotamia, settling there and engaging in business and even politics. Many Jews, while remaining devout Jews, did not go back to their homeland. They carried on their lives in their new home, and as the Persian Empire consolidated its rule, some Jews even rose to high positions of service in the imperial court. It was during the end of the Exile, among the Jews now living in the Persian Empire, that the first significant contact was made between the Jewish and Iranian cultures. And it is evident in the Bible that Jewish thinking changed after the Exile. The question is then: are these changes the result of the cultural meeting of Jewish and Iranian thinkers, or are these changes due to the shock of Exile? During the Exile, Jews had to change not only how they worshipped, since they no longer had their temple or the animal sacrifices which had been at the center of their faith, but also how they thought about God. The Jewish concept of God as their tribal protector, who would save them from being conquered or exiled, had to undergo revision. I believe that both factors are present, inspiring the changes in post-exilic Judaism: not only the Jews thinking new thoughts about God and humanity, but also contact with the Zoroastrian religion of the Persian Empire. But then another question arises: how did the ancient Jews learn about Zoroastrianism? It is highly unlikely that Jewish scholars and thinkers ever directly encountered Zoroastrian scriptures such as the Gathas (the founding text of the Zoroastrian faith, attributed to the Prophet Zarathushtra himself) or the Yashts (hymns of praise to various intermediate deities and guardian spirits, adapted from pre- Zarathushtrian mythology). The priestly usage and archaic language of the Avesta scriptures would be a barrier to Jews. But most of Zoroastrianism, known and practiced among the people, existed in oral tradition: through word of mouth, not by the study of written scriptures. This oral tradition included stories about God, the Creation, the ethical and cosmic conflict of Good and Evil, the divine Judgment and the end of the world. The tradition would also include the well-known Zoroastrian symbolism of fire, light and darkness, as well as stories and prayers about the yazatas or intermediate spiritual beings and the Prophet Zarathushtra. These are all elements of what might be called "classic" Zoroastrianism (as it developed from the "primal" Zoroastrianism of the Gathas). This is how the Jews encountered Zoroastrianism - in private dialogues and political and civic experience, rather than in formal religious studies. And as the Jewish religion was re-made after the catastrophe of the Exile, these Zoroastrian teachings began to filter into the Jewish religious culture. There are some venturesome scholars who say that the Jewish idea of monotheism was inspired by contact with Zoroastrian monotheism. While it is true that Jewish monotheistic ideas did change after the Exile, I do not believe that it was Zoroastrian contact which inspired this change. Rather, it was the fact of the Exile itself. Jewish thinkers and prophets even before the Exile were hinting at a concept of One God who was greater than just an ethnic divinity. When the Captivity threw these thinkers into a foreign culture, away from their divinely appointed homeland, it was necessary to broaden their idea of God to a more universal and abstract deity, who could be worshipped with praise and moral actions rather than animal sacrifices and liturgies. The concept of a single God whom all nations would eventually worship evolved among a conquered and exiled people no longer assured of their divinely protected status. The Gathas of Zarathushtra, which may pre-date Cyrus by almost a thousand years, do describe God in universalist and abstract terms, but by the time of the Jewish contact, it is unclear just what type of monotheism was believed in the Zoroastrian community. Was it a true monotheism which worships only One God, to whom all other gods are either evil demons or simply non- existent? This seems to be the monotheism of Zarathushtra, but not of the Achaemenid kings of the Persian Empire, who were able to incorporate the veneration of subordinate divinities into their worship, as long as these subordinates were recognized as creations of the One God and not gods in their own right. The Jews, as we will see, would recognize angels as semi-divine intermediaries, but would not go so far as the Zoroastrians in honoring those intermediaries with hymns of praise such as the Yashts. One of the most important differences between Jewish monotheism and Zoroastrian monotheism is that Jews recognize the one God as the source of both good and evil, light and darkness, while Zoroastrians, during all the phases of their long theological history, think of God only as the source of Good, with Evil as a separate principle. There is a famous passage in Second Isaiah, composed during or after the Exile, which is sometimes cited as a Jewish rebuke to the Zoroastrian idea of a dualistic God: "I am YHVH, unrivalled: I form the light and create the dark. I make good fortune and create calamity, it is I, YHVH, who do all this." (Isaiah 45:7) This passage, which is a major source for Jewish speculation on the source of good and evil in the world, denies the Zoroastrian idea of a God who is the source only of "good" and favorable things. Therefore I would not say that contact with Zoroastrian monotheism influenced Jewish monotheism. The philosophical minds of the two cultures may indeed have recognized each other as fellow monotheists, but this central Jewish doctrine is one which was not learned from the Zoroastrians. It grew from the original monotheistic revelation attributed to Moses, just as Zoroastrian monotheism grew from the revelation of Zarathushtra (who may indeed have been roughly contemporary, though completely unconnected, with Moses). These were two parallel journeys towards understanding of one God. There are other developments, however, in the Jewish faith which are much more easily connected with Zoroastrian ideas. One of the most visible changes after the Exile is the emergence of a Jewish idea of Heaven, Hell, and the afterlife. Before the Exile and Persian contact, Jews believed that the souls of the dead went to a dull, Hades-like place called "Sheol." After the Exile, the idea of a moralized afterlife, with heavenly rewards for the good and hellish punishment for the evil, appear in Judaism. One of the words for "heaven" in the Bible is Paradise - and this word, from the ancient Iranian words pairi-daeza, "enclosed garden," is one of the very few definite Persian loan-words in the Bible. This moral view of the afterlife is characteristic of Zarathushtrian teaching from its very beginning in the Gathas. It is also thought that the Jewish idea of a coming Savior, or Messiah, was influenced by Zoroastrian messianism. Already in the book of Second Isaiah, possibly written during the Exile, the prophet speaks of a Savior who would come to rescue the Jewish people: a benefactor, "anointed" by God to fulfill his role (the word "messiah" means "anointed one"). In many verses, he identifies Cyrus the liberator as that Messiah. The growth of messianic ideas is parallel in both Jewish and Iranian thought. Zarathushtra, in his Gathas, describes a saoshyant (savior) as anyone who is a benefactor of the people. Similarly in Jewish prophecy, the Messiah is not a single special Savior but anyone who does great things for the Jewish people - even if that person is a Persian King. But as both Persian and Jewish savior-mythology evolve, the Saoshyant - and the Messiah - take on a special, individual, almost divine quality which will be very important in the birth of Christianity. The conquests of Alexander of Macedon in the fourth century BCE created the first "global" culture (at least for the Western world) in which people, goods, and ideas could circulate from southern Europe, through the Middle East, all the way to Iran and India, and vice versa. It was in this cosmopolitan, Hellenistic world that Jews and Persians had further contact, and the Zoroastrian influence on Judaism became much stronger. This influence is clearly visible in the later Jewish writings such as the Book of Daniel and the books of the Maccabees, which were written in the second century BCE. An interesting Biblical account of Zoroastrian-Jewish contact, as well as an early attestation of Middle Eastern petroleum, appears in the Second Book of the Maccabees (which is not found in Jewish Bibles, only in Catholic Christian ones). This document dates from about 124 BCE, which places it among the latest books of the Old Testament - so late that the Jewish canon does not recognize it. In the first chapter of this book, there is a story of how the Jewish altar fire was restored to the Temple after the Captivity. Jewish Temple practice required a continuously burning flame at the altar (Exodus 27:20) though this flame did not have the special "iconic" quality of the Zoroastrian sacred fire. Nevertheless, during the restoration of the Jewish temple, this story arose and is repeated in the Book of the Maccabees, four hundred years later: "When the matter (restoring the fire) became known and the king of the Persians heard that in the place where the exiled priests had hidden the fire a liquid had appeared, with which Nehemiah and his people had purified the materials of the sacrifice, the king, after verifying the facts, had the place enclosed and pronounced sacred." (2 Maccabees 1:33-34) This shows that at least at the time of the composition of 2 Maccabees, the Jewish writers were aware of the Zoroastrian reverence for fire - and also that, if the story is true, the Zoroastrians saw and respected similarities in practice between their own religion and that of the Jews. The fiery liquid cited here is petroleum, called "naphtha," a word which arises from a combination of Persian and Hebrew words. The Iranian influence continues to be evident in Jewish writings from what is known as the "inter-testamental" period, that is, after the last canonical book of the Old Testament and before Christianity and the composition of the New Testament. This covers an era between about 150 BCE to 100 CE. These Jewish inter-testamental writings describe a complicated hierarchy of angelic beings, in an echo of the Zoroastrian concept of the holy court of the Yazatas. The Jewish idea of seven chief archangels probably has its inspiration in the seven Amesha Spentas, the highest guardian spirits of Zoroastrian belief. Jews had their own ideas of angels long before they encountered Zoroastrianism; angels were nameless, impersonal representatives of God's message and action. But after the Exile, Jewish angels gain names and personalities, and also are spoken of as guardians of various natural phenomena, just like the Zoroastrian yazatas. The Jewish and Christian idea of a personal "guardian angel" may also have been inspired by the Zoroastrian figure of the fravashi, the divine guardian-spirit of each individual human being. Zoroastrian influence on Judaism is also evident in the evolution of Jewish ideas about good, evil, and the End of Time. The original statement of the famous Zoroastrian dualism of good and evil is found in the Gathas, where Zarathushtra describes the two conflicting principles of good and evil in what might be called psychological, or ethical terms. Human beings are faced with the existence of good and evil within themselves - he describes these principles as the "beneficent" and the "hostile" spirits - and everyone must make the choice for Good in order to follow God's will. But by the Hellenistic era, Zoroastrianism had already developed its doctrine of "cosmic dualism" - the idea that the entire Universe is a battlefield between the One Good God, Ahura Mazda, and the separate Spirit of Evil, Ahriman. This view of dualism is a symbolic transformation, and an expansion, of the more psychologically based teaching of Zarathushtra that good and evil are ethical choices and states of mind. 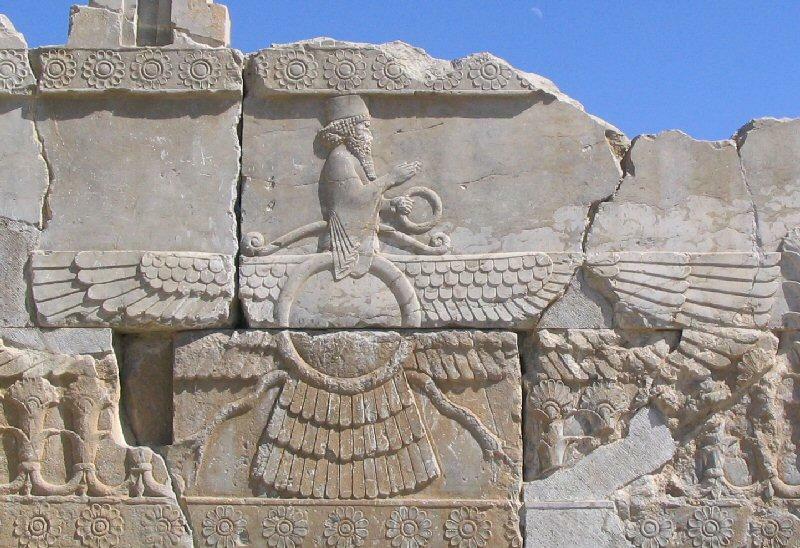 During the 7th and 6th centuries BC the ancient polytheistic religion of the Iranians was reformed and given new dimensions by the prophet Zoroaster (or Zarathusthra). Zoroaster's life dates have been traditionally given as (c. 628 - 551 BC), but many scholars argue for earlier dates. Linguistic evidence suggests that he was born in northeastern Iran, but the prophet's message was to spread throughout the Persian Empire. Adopted as the faith of the Persian kings, Zoroastrianism became the official religion of the Achaemenid empire and flourished under its successors, the Parthian and Sassanian empires. Its theology and cosmology may have influenced the development of Greek, later Jewish, Christian, and Muslim thought. The Muslim conquest of the 7th century AD marked the beginning of a steady decline of Zoroastrianism. Persecution resulted in the migration (about the 10th century) of the majority of Zoroastrians to India, where the Parsis of Bombay are their modern descendants. The religion of ancient Iran was derived from that of the ancient Indo Europeans, or Aryans. The language of the earliest Zoroastrian writings is close to that of the Indian Vedas, and much of the mythology is recognizably the same. Two groups of gods were worshiped, the ahuras and the daevas. 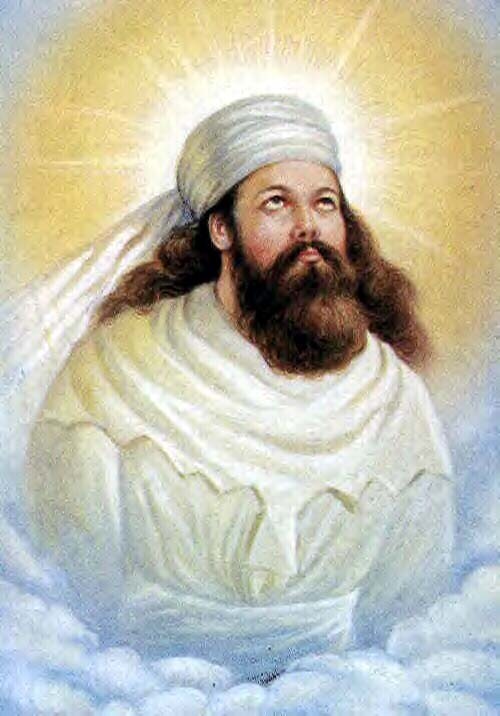 The worship of the ahuras (lords) may have reflected the practice of the pastoral upper classes, and tradition holds that Zoroaster was born into a family that worshiped only the ahuras. The message of the prophet, however, was that Ahura Mazda, the Wise Lord, was the sole creator and lord of the world and that the worship of the daevas was the worship of evil. In Zoroaster's theology the Amesha Spentas, or Bountiful Immortals, were divine beings who acted essentially as agents of the power of Ahura Mazda; they were traditionally seven in number: Bounteous Spirit, Good Mind, Truth, Rightmindedness, Dominion, Health, and Life. The first of these, Spenta Mainyu, is of special importance in that he is paired with a "twin," Angra Mainyu, or Hostile Spirit. When given a choice between good and evil, or truth and the lie, Bounteous Spirit chose truth and Hostile Spirit the lie. Creation becomes a battleground, with the demoted ahuras invoked for the doing of good and the daevas enlisted by Angra Mainyu in the doing of evil. Nevertheless, Ahura Mazda has decreed that truth will triumph, and the old world will be destroyed by fire and a new creation instituted. In the period following Zoroaster, for which little evidence remains, Zoroastrianism consolidated its position and spread throughout Iran. The rise of the southern Persians and Medes seems to have been accompanied by the reinstatement of many of the ahuras, although Ahura Mazda is still recognized as supreme god. Among the most important figures to revive at this time were Mithra (Mithraism), usually associated with the sun, and Anahita, associated with the waters and fertility. Ahura Mazda (who becomes Ormazd) becomes identified with Spenta Mainyu, and Angra Mainyu (Ahriman) remains his antagonist. Ahura Mazda has relinquished some of his absolute supremacy and appears to need the assistance of the lesser ahuras, particularly Mithra, who appears as mediator and protector of the created world. This dualist view eventually became the orthodox position. Its development may have owed much to the Magi, a hereditary priestly caste, although their role is unclear. From them, however, the Greco Roman world learned much of what it knew of the religion. An important reform movement, however, arose within Zoroastrianism - the movement around Zurvan. The Zurvanites posited a supreme god, Zurvan (Infinite Time), who had sacrificed for 1,000 years in order to gain offspring. At the end of that time he experienced momentary doubt, and from that doubt arose Ahriman; at the same time, Ormazd came into being because of the efficacy of the sacrifices. At the end of 3,000 years Ahriman crossed the void that separated them and attacked Ormazd. The two made a pact to limit the struggle, and Ahriman fell back into the abyss, where he lay for 3,000 years. During that period Ormazd created the material and spiritual world; in retaliation, Ahriman called into being six demons and an opposing material world. In the next 3,000 year period Ahriman attempted to corrupt the creation of Ormazd; he was successful but was trapped in the world of light. The final period of 3,000 years was ushered in by the birth of Zoroaster, who revealed this struggle to man; the prophet is to be followed by three saviors, appearing at intervals of 1,000 years. At the appearance of the last, a day of judgment will occur, the drink of immortality will be offered to those who have fought against Ahriman, and a new creation will be established. The sacred literature of Zoroastrianism is found in the Avesta, which was compiled sometime during the Sassanian period (224 - 640 AD) from much earlier materials. Only a portion of the Avesta remains, but the language of its earliest sections is extremely ancient, closely related to that of the Indian Vedas. These sections, the Gathas, are thought to be by Zoroaster himself. They are hymns and form the primary part of the Yasna, the central liturgy of the religion. Also contained in the Avesta are the Yashts, hymns to a number of the ahuras, and later in date than the Gathas. 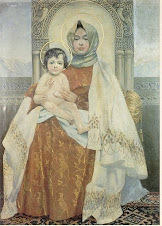 Finally comes the Videvdat, which is concerned with purity and ritual. A large body of commentary exists in Pahlavi, dating from the 9th century AD, which contains quotations from earlier material no longer extant. 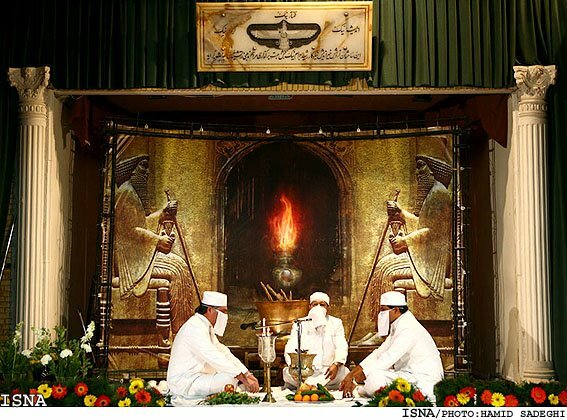 The rituals of Zoroastrianism revolve around devotion to the good and the battle against the forces of evil. Fire plays a major role, being seen as the manifestation of the truth of Ahura Mazda, as preached by Zoroaster. Also important is the ritual drink, haoma, which is related to the Vedic soma. The icons of this ancient Mediterranean cult can be deciphered only in terms of a worldview that placed the powers controlling human destiny not on the earth but in the stars. In hundreds of underground temples scattered across the territory of the Roman Empire from England to Syria, modern archaeologists have uncovered paintings and carvings of a young man killing a bull. The significance of this picture, the central icon of a secretive cult known as Mithraism, has been one of the great unsolved archaeological mysteries of this century. What mythical event is depicted by these figures? What clues does the bull slaying yield about the teachings of the cult? I and several other researchers have come to a conclusion that may seem unlikely at first: the image does not represent a myth about events on the earth; instead it is an astronomical code with strong religious implications. This surprising interpretation gains credibility when considered in light of the widespread religious and social upheavals of the time. Mediterranean civilization in the seven centuries between Alexander the Great and Constantine provided exceptionally fertile soil for the growth of new religions. Alexander's conquests, solidified by his Hellenistic and Roman successors, rapidly created a unified Mediterranean culture out of what had formerly been a diverse collection of individual nations, city-states and tribes. Older forms of religious expression, which had generally been the product of smaller, close-knit societites, were losing their ability to furnish a sense of meaning for individuals adrift in a vastly expanded and increasingly impersonal empire. As the Hellenistic and Roman empires swallowed up the older city-states and tribes, people came to feel that the powers determining their lives lay out of reach, in the distant parts of the empire. Any philosophy or religion that could offer people a sense of understanding or control exercised a strong attraction. The emergence of Christianity was one response to these conditions. It offered membership in a symbolic community--the "New Israel"-- to people whose actual communities, now submerged in the imperial order, could no longer supply a firm sense of identity. Another response was the rise of fatalism, the idea that life completely controlled by an impersonal fate. Indeed, a personified form of Fate or Chance came to be worshipped as a god in many Hellenistic cults. The name of one Hellenistic philosophy that embraced this fatalistic worldview, Stoicism, survives today, signifying resigned endurance of whatever life may bring. The general fatalism of the time prepared the way for the success of the more specific fatalism of astrology. Astrology, which first began to gain popular acceptance during the Hellenistic period (the time following the conquests of Alexander), claimed, with a persuasive aura of mathematical accuracy, that all events were pre-determined by powers residing in the stars. The growth of fatalism and astrology in this period makes it plausible that a religion based on the stars should have arisen. The cult known as the Mithraic mysteries, or Mithraism, was one of the most important--and certainly one of the most intriguing--of the religions that arose at about the same time as Chrstianity. It came into existence in the first century B.C. ; Plutarch writes that the Cilician pirates were practicing Mithraic rites by 67 B.C. (The pirates, based in the province of Cilicia in Asia Manor, numbered about 20,000; at their height their operations extended over the entire Mediterranean Sea.) Mithraism reached its peak in the third century and finally succumbed to the expansion of Christianity in the late fourth century, about the time that the Western Roman Empire was falling. The cult's membership for the most part comprised soldiers, state bureaucrats and merchants; women were excluded. Like a number of other ancient religions (the mysteries of Isis and the Eleusinian mysteries among them), Mithraism limited its membership to those who had passed through a secret initiation ritual. Initiates were forbidden to speak to outsiders about cult secrets, and hence, they were named mysteria, a word whose root means to keep silent. The English word mystery and related words such as mysticism are ultimately derived from the Greek name for the cults. Mithraism was organized around seven distinct grades of initiation, forming a hierarchical structure through which members gradually ascended. The cult's secrecy meant that no written record of Mithraic doctrines survives. As a result, the only information available to scholars attempting to reconstruct the cult's teachings is the elaborate iconography that decorates the temples. Most of it depicts various activities involving the cult's god, Mithras; the crucial scene is the so-called tauroctony, or bull slaying, in which Mithras, accompanied by various figures, is shown in the act of killing a bull. A tauroctony is found in the most prominent location in virtually every Mithraic temple, and it is clear that this icon holds the key to the central secret of the Mithraic mysteries. In the absence of any written explanation, however, deciphering it has proved a notoriously difficult task. For most of the 20th century scholarly attempts to explain the tauroctony were dominated by the work of Franz Cumont, the famous Belgian historian of religion. Cumont's interpretation, first presented in 1899, was based on the fact that Mithras is the Greek and Latin name of a much older Iranian god, Mithra. Cumont concluded that Mithraism was imported from the ancient Iranian cult of Mithra, who represented light and truth and was believed to be the special guardian of contracts and agreements. Cumont argued that deciphering the tauroctony was simply a matter of finding parallels to its symbolic elements in ancient Iranian mythology. Cumont's approach had significant problems. Most important, there is no known Iranian myth in which Mithra has anything to do with killing a bull. Cumont seized instead on an Iranian creation myth in which Ahriman, the embodiment of evil, kills a bull from whose blood and body spring all the living creatures of the earth. He claimed that this myth must have existed in a variant form (for which there is, however, no evidence) in which the good god Mithra replaced the evil Ahriman as the bull slayer. Cumont's eminence was such that his theories remained virtually unchallenged for more than 70 years. The Iranian connection, and with it Cumont's interpretation of the tauroctony, came under concerted attack at the First International Congress of Mithraic Studies, held at the University of Manchester in 1971. Several scholars, chief among them John Hinnells of Manchester and R.L. Gordon of the University of East Anglia, suggested that Mithraism had in fact been created as a completely new religion somewhere in the Greco-Roman world and that it had merely adopted the name of the Iranian god to give itself an exotic flavor and an aura of antiquity. If the tauroctony did not represent an Iranian myth, what did it represent? Starting in the mid-1970's, several scholars (including Roger Beck of the University of toronto, Stanley Insler of Yale University, Michael Speidel of the University of Hawaii, Alessandro Bausani of the University of Rome and me) put forward new interpretations of the tauroctony (and of Mithraism) based on the hypothesis that the picture is actually a star map. Astrological beliefs permeated Mediterranean religious and intellectual life at the time Mithraism originated. In part this was the result of the fatalism of the age. In addition, for individuals cut off from their local traditions and free to move at will anywhere in the empire, astrology filled the need for new symbols that could help make sense of everyday life but were not tied to a particular locality or community, as were the older religious forms. The configurations of the stars appeared the same no matter where in the empire one traveled and so provided ideal raw material for such a universal symbolic system. The acceptance of astrology led to a growing belief that the dwelling place of the gods was in the realm of the stars. For example, it was during the Hellenistic period that it became the standard practice to call the planets by the names of various Greek gods, such as Zeus (Jupiter) and Ares (Mars). Astrology also encouraged a new conception of life after death, according to which the soul did not go to the underworld, as had earlier been believed, but rather rose through the planetary spheres to the sphere of the fixed stars and then to the paradise that lay beyond the outermost sphere. In time this journey came to be imagined as difficult and dangerous, with secret passwords required to cross each planetary threshold. Astronomical concepts must have been important in Mithraism, given the frequent appearance of astronomical symbols in Mithraic iconography. The 12 signs of the zodiac and symbols of the sun, moon and planets often appear together with the tauroctony and elsewhere in Mithraic art. The classical author Eubulus, writing during the first or second century, said that the Mithraic temple was meant to be "an image of the cosmos." It now appears that the tauroctony itself was an astral symbol. In addition to Mithras and the bull, the tauroctony contains a number of other figures: a dog, a snake, a raven, a scorpion and sometimes a lion and a cup. It cannot be coincidence that each has a parallel among the constellations: Canis Minor, Hydra, Corvus, Scorpio, Leo and Crater; the bull is paralleled by Taurus. My work has been directed toward explaining how these constellations could come to form the central icon of a powerful religious movement. These seven constellations, I have found, are linked in the sky as well as in the tauroctony. With the exception of Leo, they lie along a path defined by an ancient position of the celestial equator. The celestial equator is a projection of the earth's equator onto the celestial sphere. It is an imaginary circle tilted at an angle of 23 degrees to the plane of the earth's orbit (the ecliptic, or the plane that defines the circle of the zodiac). The celestial equator crosses the zodiac at the equinoxes-- the points on the celestial sphere where the sun appears to be on the first day of spring and the first day of autumn. In antiquity the celestial equator was far more than merely an imaginary circle. Ancient astronomers believed that the earth was located in the center of the universe and was absolutely immovable; the fixed stars were attached to a great sphere that rotated around the earth once a day on an axis running between the sphere's north and south poles. Features of this sphere, such as its poles and equator, played a crucial role in the ancient understanding of the structure of the cosmos. As a result, the celestial equator was much better known in antiquity than it is today; for example, Plato, in his dialogue Timaeus, writes that the creator of the universe began the formation of the cosmos by shaping its substance into the letter X to represent the crossing of the ecliptic and the celestial equator. For most of antiquity it was believed that the axis of the celestial sphere was, like the earth, immovable. In fact, the earth's rotational axis (the modern equivalent of the ancient cosmic axis) is not fixed; it has a wobbling movement. As it wobbles, the celestial equator wobbles with it, and the relative positions of the equator and the ecliptic change. This so-called precession of the equinoxes means that the position of the sun in the sky at the equinox moves backward along the ecliptic, and so the equinox occurs slightly earlier every year. The complete precession takes approximately 25,920 years; the sun moves through one constellation every 2,160 years. Today the spring equinox is in the constellation of Pisces; in about the year 2200 it will enter Aquarius. During Greco-Roman times the spring equinox was in Aries, which it had entered in about 2000 B.C. Before that it was in Taurus. With the exception of Leo, all the constellations in the tauroctony lie on the celestial equator as it would have been seen when the spring equinoxwas in Taurus. (Leo marks the sun's location at the summer solstice-- the position of which is also shifted by the precession-- in that era.) The arrangement of constellations in the tauroctony, then, matches an astronomical situation that prevailed 2,000 years before the origins of Mithraism. How could Mithraists have known of this ancient astronomical arrangement, and why would they have seen it as having religious significance? The precession of the equinoxes was unknown for most of ancient times. It was discovered in about 125 B.C. by the Greek astronomer Hipparchus, only a few decades before the initial rise of Mithraism. His careful observations showed the celestial equator was in fact gradually shifting backward through the zodiac. His calculations also made clear which constellations would have lain along the celestial equator when the equinox was in Taurus (its most recent position before the Greco-Roman period). From the geocentric perspective, the precession (a movement of the earth) appears to be a movement of the entire cosmic sphere. For people who held both a geocentric worldview and the belief that the movements of the stars influenced human fates, the discovery of the precession would have been literally world-shaking: the stable sphere of the fixed stars was being unseated by some force apparently larger than the cosmos itself. Ancient intellectuals, accustomed as they were to seeing the work of the gods reflected in the works of nature, could easily have taken this great movement as evidence for the existence of a powerful, hitherto unsuspected deity. The meaning of the tauroctony now becomes clear: the death of the bull aptly symbolized the end of the reign of Taurus as the constellation of the spring equinox and the beginning of the most recent era. The other figures in the tauroctony all represent constellations whose special position in the sky was also ended by the force of the precession. By killing the bull-- causing the precession of the equinoxes-- Mithras was in effect moving the entire universe. A god capable of performing such a tremendous deed would be eminently deserving of worship. Furthermore, the ability to move the cosmos would be seen as endowing Mithras with other powers as well, such as the ability to overcome the forces of fate residing in the stars and to guarantee the soul a safe passage through the planetary spheres after death. 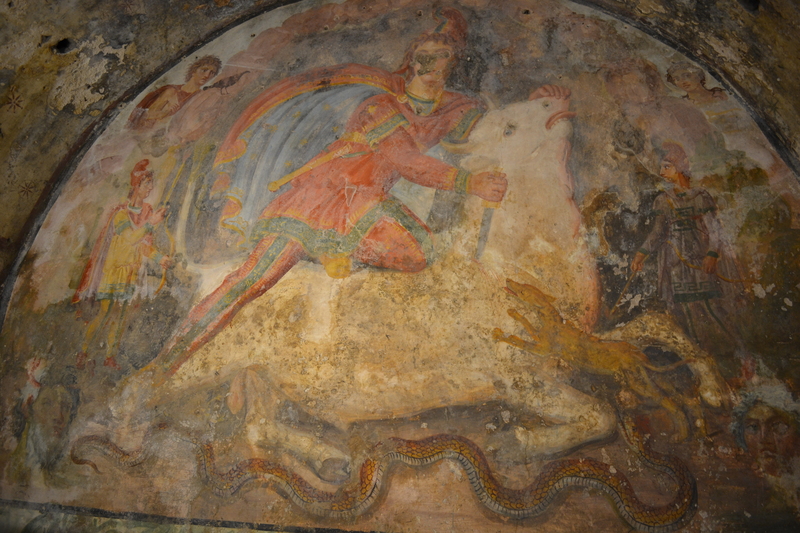 Other Mithraic images indicate that Mithras was in fact believed to embody such cosmic power; there are scenes that show Mithras bearing on his shoulder the sphere of the universe or in which a youthful Mithras holds the cosmic sphere in one hand while with his other he rotates the zodiac. In several tauroctonies, the starry sky is shown contained beneath Mithras's cloak. The status of Mithras as the motive force behind the precession of the equinox could also explain the secretive nature of the Mithraic mysteries. Adherents could well have believed that their knowledge constituted a powerful secret best kept to themselves and among selected initiates. For those chosen, an understanding of the complex astronomical structure underlying the nature of Mithras would have required a lengthy period of indoctrination. Only after acquiring the requisite knowledge could initiates properly appreciate this new god. An important question remains: If all the figures in the tauroctony represent constellations, then what constellation does Mithras represent? In the tauroctony, Mithras is located directly above the bull and is always depicted as a young man carrying a dagger and wearing a distinctive conical hat known as a Phrygian cap. The sky directly above Taurus, in fact, contains a constellation typically represented as a young man carrying a dagger and wearing a Phrygian cap: the Greek hero Perseus. Moreover, Perseus was worshipped as a god in Cilicia--precisely the region to which Plutarch traces the origins of Mithraism. Tarsus, the capital city of Cilicia, was the home of one of the most important intellectual communities in the Mediterranean. This community was dominated by Stoic philosophers who were famous not only for their fatalism (which led them to be firm believers in astrology) but also for their tradition of personifying natural forces in the form of gods and heroes. Most likely, Mithraism arose as intellectuals in Tarsus, speculating about the force responsible for the newly discovered precession of the equinoxes, personified that power in the local Cilician god Perseus. Perseus, after all, was already identified as a constellation, and the message of his position in the sky was clear to read. But if Mithras was originally in some sense Perseus, how did his name come to be Mithras? First, of course, it would make sense for a mystery religion to conceal the true name of its deity. Second, because of the sound of his name, Perseus was believed in antiquity to have been the founder of Persia (Iran) and thus could easily have become linked mythologically with the Iranian god of light and truth, Mithra. Third, around the time of the origins of Mithraism, most of Asia Minor came under the control of King Mithridates of Pontus, who formed a strong alliance with the Cilician pirates. Mithridates belonged to a dynasty named after Mithra; in addition, he and his ancestors believed that they were descended from Perseus. It was probably in the circles around King Mithridates-- who fancied himself an intellectual and took a special interest in Greek religious beliefs-- that the link was formed between Perseus and Mithra that eventually led to the adoption of the name Mithras (the Greek form of the name Mithra). Today Christianity is one of the world's dominant religions; Mithraism (along with any number of other cults) died out. Why? One crucial difference between the two is that from its beginning Christianity sought to make as many converts as possible. The author of the gospel of Matthew, for example, ends by having Jesus say, "Go, therefore, make disciples of all the nations." Mithraism, in contrast, was based on a secret, and secrets lose their appeal in direct proportion to the numbers of people who know them. In addition, Mithraism took hold mostly among groups of people-- soldiers, bureaucrats, merchants-- who were intimately bound up with the existing social order of the empire, and the cult's hierarchical structure fitted that order in a way that early Christianity, with its apocalyptic doctrine of the return of the messiah and disregard of earthly matters, did not. Early Christians (who were typically people whose social status was problematic in one way or another) possessed a revolutionary zeal that was completely absent in Mithraism. While early Christians sought to enlighten the world, then, adherents of the Mithraic mysteries sought individual enlightenment and advancement within the existing culture. As a result, Mithraists had no hesitation in adopting practices that would necessarily limit the size of the cult's membership, such as excluding women from the cult, constructing temples as small underground cavities and establishing a complex series of initiation rites. The heart of the matter, then, is not so much why Mithraism did not grow as Christianity did but rather how Christianity achieved the spectacular success that it sought: by the end of the fourth century it had led to the almost total elimination of competing religions in the Mediterranean world. The precise reasons for Christianity's success are, of course, a matter of intense scholarly debate. There is a general consensus, however, that one of the most important factors was exclusivity. Becoming a Christian required that a convert give up all other forms of religious worship. Other religions of the times demanded no such single-mindedness: one could be an initiate of Mithras as well as of Isis, participate in sacrifices to Jupiter and at the same time venerate the spirit of a dead emperor. In a time when many people were experiencing the collapse of their traditional sources of meaning, the radical exlusivity of Christianity exercised a powerful appeal: it gave prospective converts the opportunity to make a truly decisive choice; those who did convert could believe that their lives had gained a real purpose and significance. In an age of confusion, Christianity offered its adherents a clear sense of identity. It is particularly interesting to note that Christianity appealed to some of the same astral-religious conceptions that lay behind Mithraism and other cults. Jesus was frequently described as having a power over the world of the stars. The author of the gospel of Mark (the earliest of the Christian gospels), for example, begins his story by describing how Jesus, at the moment of his baptism, "saw the heavens torn open." Through this image the author seems to have been attempting to convey the idea that the life of Jesus constituted a rupture of the cosmic order, the expression of a power greater than that of the heavens. The same author also presents Jesus as saying, "In those days... the stars will fall from the sky.... Heaven and earth will pass away, but my words will not pass away." Paul's letter to the Galatians reads in part: "When we were children, we were enslaved to the elemental forces of the cosmos, but when the fullness of time came, God sent forth his son.. .to free [us]." Just as Mithras, by shifting the celestial sphere, upset the order of the universe, so the coming of Jesus was believed to have produced a rupture in the fabric of the cosmos. Not only early Christianity and Mithraism but also many other religions and philosophical movements of that period expressed this same yearning for identification with a force that could break the boundaries of the cosmos and provide access to realms outside the limits of ordinary experience. Such a yearning was spurred by the upheavals of the time: as the local foundations of culture were undermined, individual horizons could expand. At the same time, scientists' imaginations suddenly stretched out to encompass a grand vision of the celestial spheres. Today's world, with its increasingly global culture and a science that in a single generation has leaped past the farthest galaxies, shows striking parallels with that ancient Mediterranean age. Then Mithras returned to the earth to teach humanity His commandments and begin Mysteries and Rites which would help humans remember His acts on our behalf. Because of His actions, we can choose good without the overwhelming power of evil, even though evil's influence can still seem powerful because our minds believe it is. Because of His teachings, we know that the purpose of our lives is to serve others in the name of Mithras. The followers refer to Him as the "Light of the World" a phrase often used also in Christian faith when referring to Jesus. This son of a god born of a virgin, was so commonly spread in those days that Philo of Alexandria (30 BCE - 45 CE), warned against this widespread superstitious belief in unions between male gods and human females. The offspring’s are known as demigods. Trinity― Trinities were popular in pagan sects before Christianity was introduced to the world. Some of the more well known trinity gods included Mithra-Vohu Mana-Rashnu, Amen-Mut-Khonsu, and Osiris-Isis-Horus. Virgin Birth―Among the pagan cultures that preceded Christianity, virgin birth stories abounded. The long list of pagan gods born of virgins includes: Romulus and Remus, Zoroaster, Buddha, Mithras, Chrishna, Osiris-Aion, Agdistis, Attis, Tammuz, Adonis, Korybas, Perseus, and Dionysus. Disciples― In the following 'saviors' cases, a grouping of disciples was present, just as they were present in Jesus' story: Horus, Buddha, Chrishna, Dionysus, Mithra. Interestingly enough, in the case of Dionysus, his disciple Acoetes was a boatman, just as Jesus' disciple Peter. And just as Peter was freed from jail when the doors miraculously flew open, so was Dionysus' disciple Acoetes. In Budda's case, he, like Jesus, demanded that his disciples renounce all worldly possessions. Yet another instance of similarity is that the disciples of both Jesus and Buddha were said to have been arrested for preaching, as well as witnessed to have "walked on water." Miracles― Among those 'saviors' who, like Jesus, performed countless miracles include: Horus, Chrishna, Buddha, Dionysus, Mithra, Osirus, and Adonis. Horus was said to have walked on water, just as Jesus did. In addition, Horus raised one man, El-Azarus, from the dead in front of countless witnesses. In the case of Buddha, it was told that he fed five hundred men with one loaf of bread, that he cured lepers, and that he caused the blind to see. Dionysus rescued a person from dying when the person was utterly desolate and placed them among the stars. And he gave food and drink, herbs and berries, to the starving people -- not to mention turning water into wine. The Sun― Here is another common theory, quoted from S. Acharya's "The Origins of Christianity and the Quest for the Historical Jesus:" "The reason why all these pagan narratives are so similar to a "god-man" is that these stories were based on the movements of the sun through the heavens, an astrotheological development that can be found throughout the planet because the sun and the 12 zodiac signs can be observed around the globe.